Saving lives, one flight at a time. 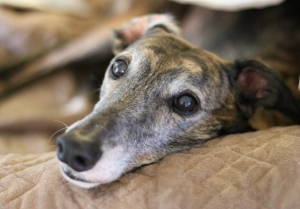 When we adopted Lily the greyhound in 2010, she quickly became a best friend to her big sister London. London was quiet and reserved while Lily had an outgoing and playful spirit. They enjoyed spending time together and quickly became inseparable. After London passed away a few months ago, Lily’s eagerness to snuggle and cuddle with family members seemed to grow. The cold winter months were made to feel a lot warmer with Lily by our sides. Just as winter began to give way to spring, Lily began to limp. As we did with London, we immediately sought medical attention for Lily. The X-rays revealed cancer, and it is with tremendous sadness that we share the news that Lily passed away. At Brave Tide, our mission is to save lives one flight at a time. We know firsthand how much joy the animals we transport bring to their forever families. While very sad, the passing of our greyhounds opens our home to more dogs waiting to join their forever families. London and Lily will live on in our hearts, and they will continue to inspire us on the ground and in the air. Stay tuned for more information about future transport missions. Thanks for your support and encouragement! Follow Brave Tide on Twitter!